The buttons were originally purchased for the Saddle Shoulder Aran Cardigan, from Spun Out #49, but he changed his mind and wanted a vest. Looking at the Saddle Shoulder Aran Cardigan in a more fitted model than the one shown in the pattern, I thought that just by removing the sleeves (and with maybe just a tad more width removed at the armholes), a great vest would be made. 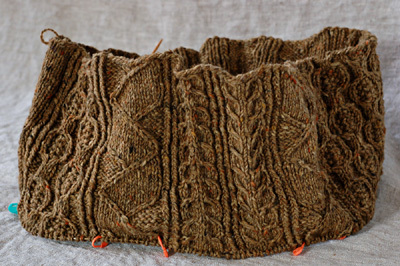 As you may know, this pattern/recipe gives you all the freedom you could ever want in terms of sizing and selecting cables and edge treatments, but also provides charts for the cables used in the sweaters shown. Elizabeth Zimmermann’s Sheepfold Cable (this looks like a folded ribbon) is included, as well as a Fishbone (I added a reversed Fishbone, as well), both of which I adore far too much to leave out. Poking through all my stitch dictionaries for a third cable, one leapt out at me- the Banjo Cable in one of Barbara Walker’s Treasuries. Mr HelloYarn’s singular passion is playing the banjo, so it was all too perfect for words. I took measurements from the vest he’s wearing in that photo and got to swatching. The yarn is Classic Elite Skye Tweed, which I stashed wholeheartedly when Webs had the closeouts. This yarn seems like it wasn’t washed post-spinning and is quite oily and stiff. It does crazy things when washed, at least in hot water, which is how I treated my swatches. It blooms and plumps and softens into a very solid-feeling and spongy fabric. Some of the cable definition, which is so amazingly crisp when first knit, is lost, but the scrummy feel makes up for it. Because we’ve got to use those buttons, the vest will open in the front, so this puppy will have a steeked opening. I practiced Meg Swansen’s crochet-secured steek on my swatches and determined that it is the best invention since yarn and needles, perhaps. It’s clean-looking, flexible, and much fun to execute. It’s so awesome that I’ll do the arm holes and neck, too. The steek is on the wide side (7 sts.) so that the folded-under part will create a nice facing when I add the button band. Kent’s making one, too. It’s super gorgeous and he’s even sharing his charts. He put a lot of thought into his and swatched like a MANIAC, so definitely check it out if you haven’t, already. I’ll have some kits for the next update. 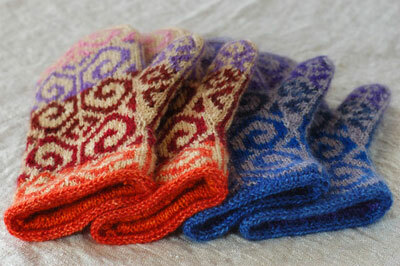 The test knitters are plugging away and making absolutely lovely mittens. 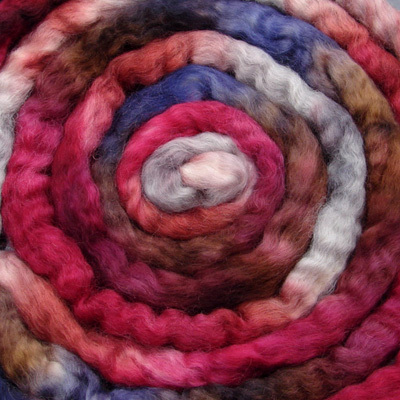 The pattern is pretty much good to go and that leaves the dyeing. I plan on making a couple of different colorways for each shop update, not to be repeated, so if you don’t dig any colorways in a certain update, all you have to do is wait a couple of weeks for fresh choices. Cool? * Note to self: add slipper soles, since this post is what made you knit the slippers in the first place. ** I act put-upon, but it’s all an act. 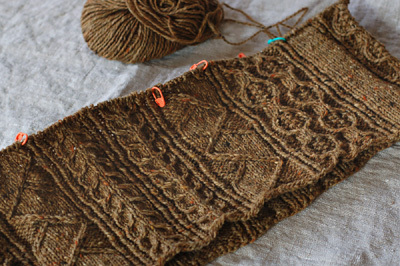 :) This is such great fun to knit and while knitting it, I ruminate about all the other cabled sweaters I want to knit, mainly Na Craga from Alice Starmore’s Aran Knitting, which I do believe needs to be the next Two Person Knit-Along with Jared. He agrees! Well, it was his idea, actually.